Novelty items don't have to be useless. At Promotion Pros, we believe that novel and useful can go hand in hand, which is why we've developed a wide range of custom goodies packaged with gift. If you enjoy stylish gift packages, you will find the chocolates and wallet gift set to your liking. If your preferences are more colorful, our company logo novelties such as the lemonade straw sipper kit or the promotional leather wrapped tumbler gift set with colorful chocolate candies will be right up your alley. Whether you're looking for a small thank you gift or holiday office presents, a Gourmet Sampler Tower is the ultimate sweet reward. 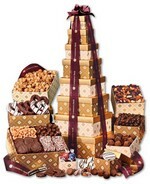 Treat the office to a gourmet, heavenly surprise with a Grand Gourmet Tower to delight their taste buds. Make this Navy Magnetic Closure Keepsake Box a part of your holiday gifts or thank you giveaways for a memorable sweet reward. Whether you're looking for a small thank you gift or holiday office presents, a President's Choice is the ultimate sweet reward. Make this Toffee & Turtles in Navy Magnetic Closure Gift Box a part of your holiday gifts or thank you giveaways for a memorable sweet reward.